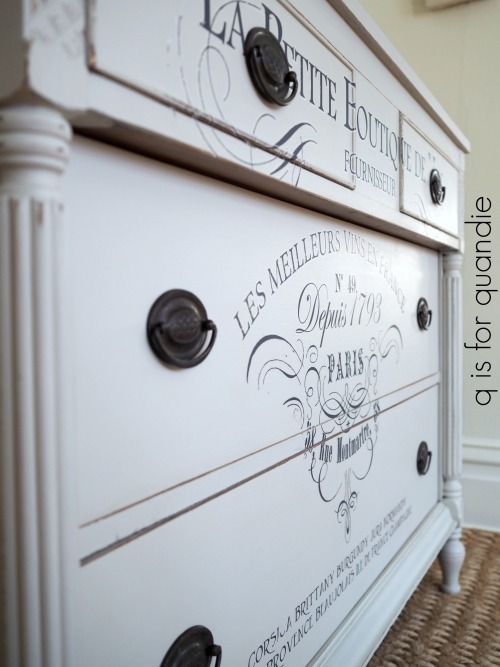 I sent Mr. Q off to pick up this lovely dresser one afternoon last week. It wasn’t far away so it was easy for him to pop over and buy it while I was still at work at the day job (well, technically I was getting my hair cut on my lunch hour at the time, hi Tamara!). It has a rather classic traditional style, wouldn’t you say? You can barely see them, but it has a pair of hankie drawers attached to the top. I’m not a fan of the hankie drawer. I’ve removed them from many dressers over the years. Having those two boxes permanently adhered at either end of the top makes it difficult to put anything else on top of this piece, like a TV for instance. And in the case of this dresser, I think it could easily be used as a buffet in the dining room, but not with hankie drawers. Usually there are a couple of screws holding the drawers in place, and that was the case with this dresser too. So, I unscrewed the screws, removed the boxes, filled the holes with Dixie Belle’s brown mud and you’d never know they were once there. Other than the finish being a bit worn, and the holes left by those hankie drawers, this piece was in perfect condition. I paid a little bit more for it that I normally would, but not having to make repairs meant that I could restyle this one quickly. To prep the dresser for painting I sanded it lightly and cleaned it with TSP substitute. Then I pulled out my Fusion paint in a color called Little Lamb. In the jar Little Lamb looks like a nice medium grey. What I forgot about Little Lamb is that once painted and dry it has a purplish undertone. In some lighting (such as mine) it almost looks lavender. It’s a pretty color, but not what I wanted for this piece. Here is how it looked on a bookcase I painted last year. But no worries. I just pulled out another jar of Fusion paint in Putty and was able to get away with just one coat of Putty over the Little Lamb, so I really didn’t waste any time or paint. I would have needed two coats of the Putty had I not already had that coat of Little Lamb in place. In fact, sometimes I even do this on purpose when transitioning a piece from a very dark original finish to a pale paint color. Start with a first coat in a medium shade and then move to a paler color. Once painted, I hand sanded with 220 grit sandpaper to distress and bring out some of the details on this piece. 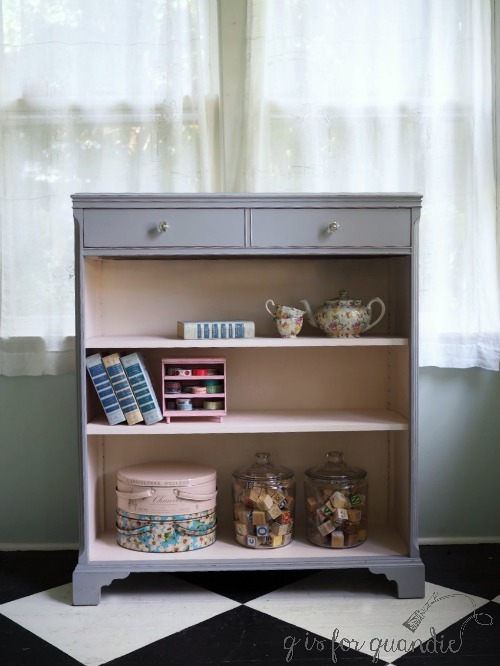 Remember, Fusion paint can be more difficult to distress than milk or chalk paints because it has a built in top coat and once cured it is incredibly durable. So if you’re going to distress Fusion I recommend either distressing right away as soon as the paint is dry to the touch (which is what I did here), or using some beeswax or hemp oil under your paint to create a resist in the areas you want to distress. After I distressed this dresser I stood back and took a look. It was pretty, but it wasn’t very exciting. 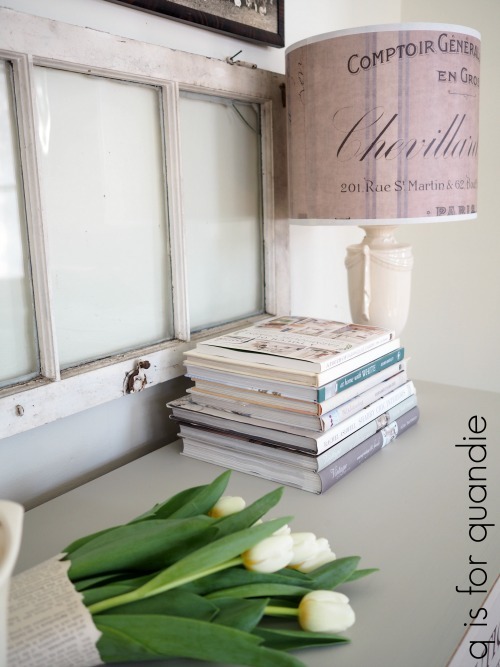 The next decision was whether to add some more detail that would really make it pop, or leave it more neutral to appeal to a wider range of potential buyers. I always struggle with this decision. After all, we all need multiple pieces in our homes and they can’t all be showstoppers. 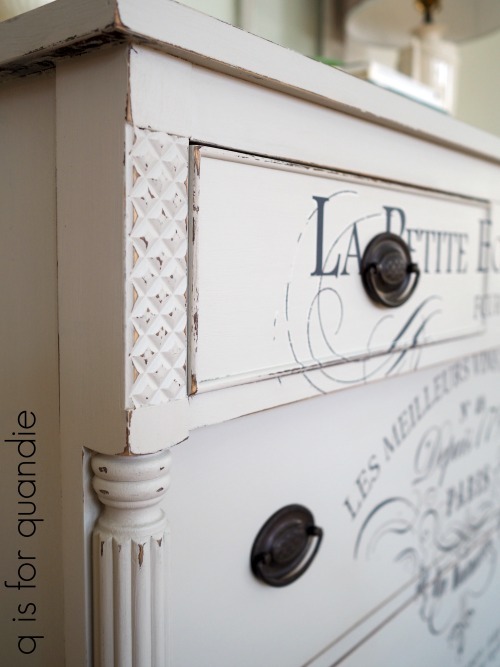 Sometimes we just need a piece that is pretty, but doesn’t steal all of the attention. Sometimes buyers are looking for a piece that they can work into their existing decor, not a piece that will require redecorating the entire room. But there was something about the top row of drawers on this dresser that was just bugging me. See it now? 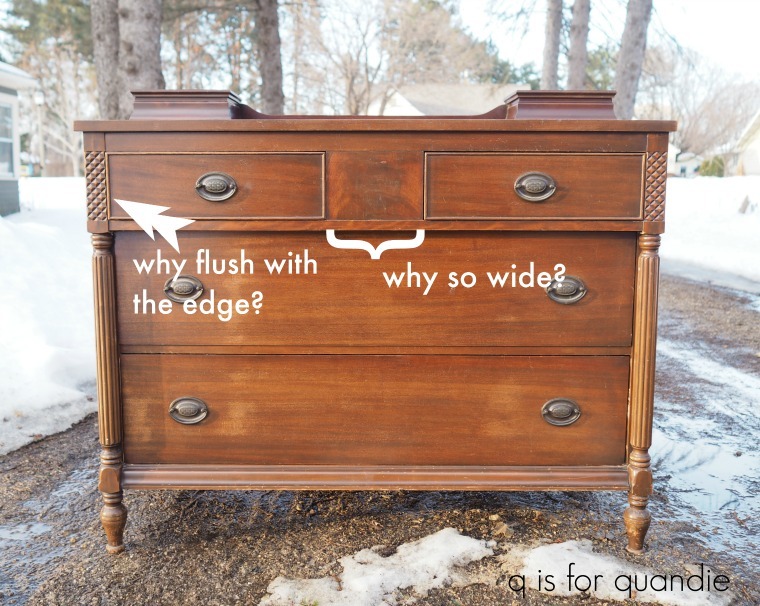 Why such a big gap in between the drawers, with the drawers flush up against the outside edges? It just feels weirdly off balance to me. Those two top drawers should be more centered. I felt the need to correct that visually if not literally. I thought one possible solution would be to add some sort of decorative detail to just that wide middle space. Maybe a small IOD rub on transfer, a stencil, or even an IOD decor stamp. But as I was digging through my IOD transfers I came across this one. 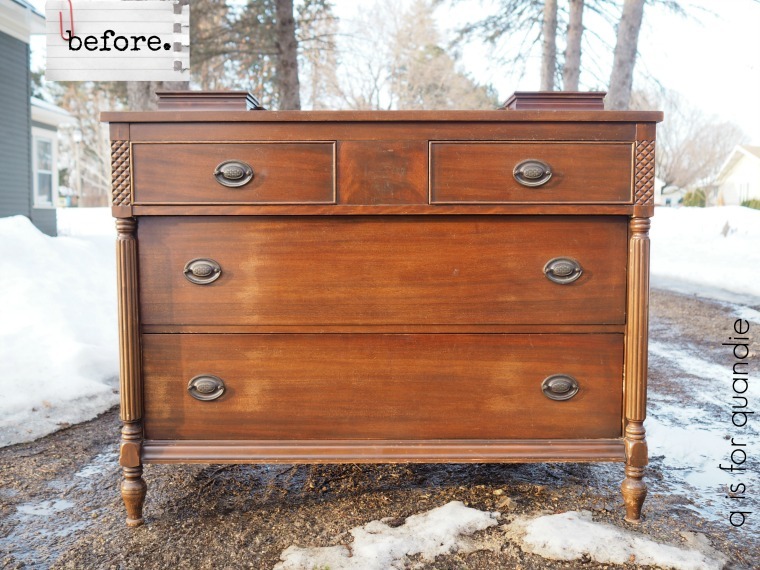 At 36.25″ x 25″ it was the perfect size to fill the entire front of this dresser. 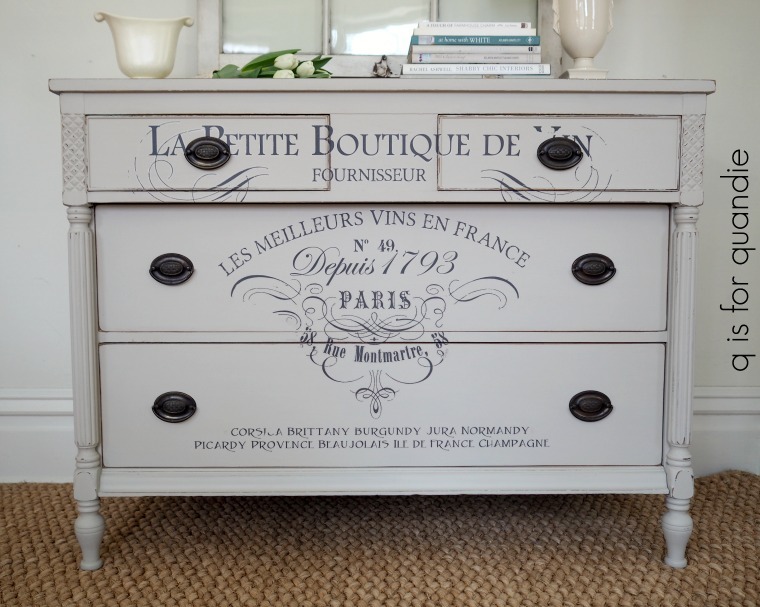 And the detail of the rub-on would do a good job of drawing your attention away from the odd placement of those upper drawers. Unfortunately I had a little trouble with the transfer. When I tried to pull the backing paper off, parts of the transfer stuck to it. No matter how I tried, I couldn’t get those bits of the transfer to detach from the backing. And one of the bits in question was the face of one of the lions. I really couldn’t apply the transfer with one faceless lion. So I contemplated my options and decided to just remove the lions completely. I cut away those sections of the transfer and kept going. As it turned out, I think I might prefer this transfer without the lions. Maybe lions just aren’t my thing. I reached out to my contact at Prima Marketing and asked if there was a solution to this problem (aside from cutting away portions of the transfer) that I should try next time. And yes, there is! If this happens to you try popping the entire thing intact into the freezer for a little bit. That should solve the problem. But I also learned that there were some issues with this in previous shipments of the transfers, but they have made some changes to correct for it. The transfers going out now shouldn’t do this (I purchased my transfer over six months ago). So if you tried an IOD transfer a while back and ran into problems with the transfer sticking to the backing paper and decided they weren’t for you, give them another try. I’ve done quite a few pieces with them (I counted, I’ve done 17 pieces with IOD transfers!) and normally I don’t have any issues. Although, spoiler alert, I have learned not to wax before applying an IOD transfer (you can wax after). But that’s a post for another day. For now, just trust me on that one. In addition, if you do have a transfer that fails, go back to your retailer and ask them to replace it. Prima Marketing will send the retailer a replacement for you. Did you notice my new lamp shade from Light Reading? I mentioned a couple of weeks ago that I was in the market for another of their gorgeous lampshades and I did find one at Piccadilly Prairie in Southdale Center. It looks amazing on the very Grecian looking lamp that I purchased at a garage sale. I’m so glad I switched to the Putty for this dresser. I love it in this pale shade. 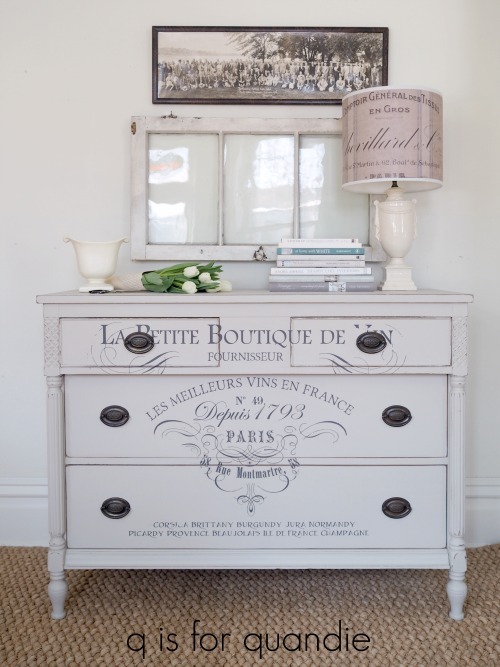 Wouldn’t this piece make a lovely sideboard in a dining room? As usual, this piece is for sale locally. Check out my ‘available for local sale‘ page for more details on this piece or other pieces I currently have listed. Previous a pair of french chairs. Another beautiful project! I would have passed on the putty color, thinking it was drab. But it’s a great neutral with hints of gray. The transfer does look great and adds the perfect finishing touch. What are you going to do with the two hankie drawers? I’m sure you have a plan! 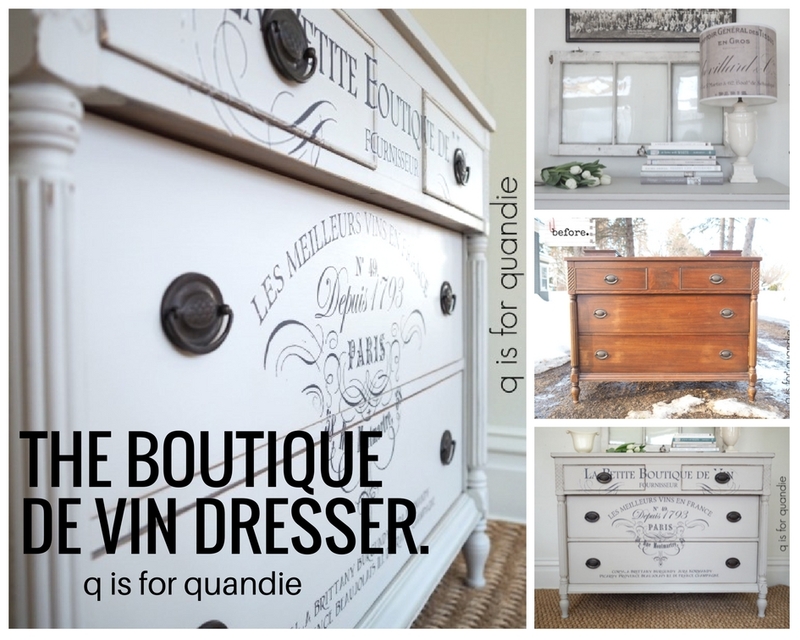 My favorite line of your whole post was “I sent Mr. Q off to pick up this lovely dresser last week.” I was positively drooling. To have a willing accomplice and muscle is to own the world. You set the bar very high for the rest of us. Your crafts(wo)manship are exceptional, as well as your tutorials, photography, narration and storytelling are without peer. Maybe what most appeals is your humility. There is no self absorption here. And, to have a willing assistant…you are blessed. I think they’d make great moist towelette boxes mounted behind the toilette! Just gorgeous! I like it better without the lions! Thanks Shelly, I do too! It really did need just a little touch of something extra! I really like the putty color. I’ve also noticed that Joanna Gaines is using it quite a bit in her Fixer Uppers, especially in tile. So, you’re right on trend 🙂 I know I’ve said it to you before, but it so reminds me of drabware which I love. Oh yes, I remember that about the drabware now. You’re so right about that! There’s always the option of combining painted and unpainted pieces. Or paint one in a accent color, and the others more neutral. So many options! I’m digging the putty color too. But really love the transfers you do. I think if I ever got started adding words to painted things, my whole house would be one big read! LOL, well, now that you mention it, there is a lot to read at my house. I love the piece and thank you for the heads up on FM little lamb. I just started using Fusion Mineral and painted my sofa with Little lamb. It is pretty but turned out a darker shade on the original cream damask fabric. I have the transfer you used and I to actually like it better without the lions. Maybe I will use them on something else. Absolutely beautiful as always! Thank you for the tips on the IOD transfers. I haven’t done one yet but am gathering info for when I get to. 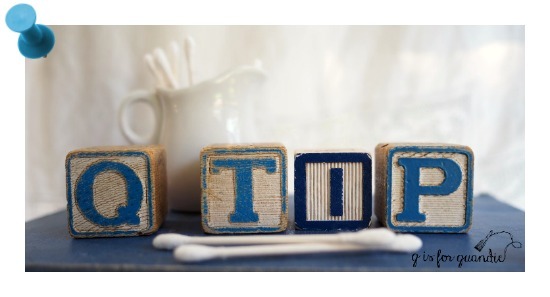 Your Q~Tips are the best! I think I like it better without the lions, too. It would have been way too busy with them. When I saw the original IOD you chose, I thought “Oh no! That’s too much!” You have a great eye! Sometimes fate/serendipity kicks in at the best of times – you first think “oh no” and end up with a “Oh yes! Perfect!” like you did on this one. 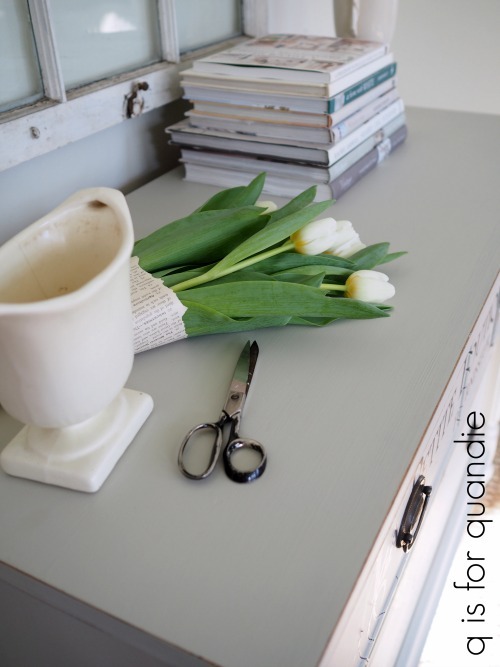 The Putty color is perfect and has always been one of my favorites – from Fusion and other brands. What an amazing transfer. Aside from the slight issue you encountered. Lovely piece good call on removing the hanky boxes. Another beautiful creation. Hope you have totally recooped from the cold/flu you had. We just keep passing it around down here. This is beautiful Linda. Great colour choices and the transfer was the perfect choice! I wish we were friends so you could help me and give me advice on a couple pieces I want ti use a transfer on. 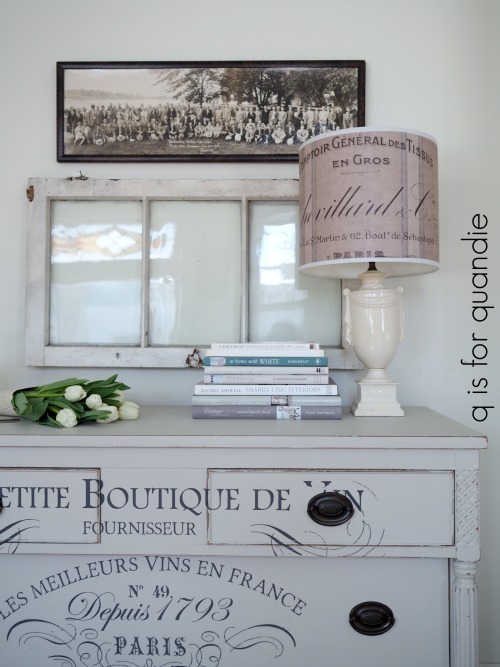 I have never used the transfers and love the look on the front of the dresser also really like that lamp shade. Well, we may not know each other, but I’m happy to give advice. My best advice about using the transfers for the first time is to watch the Iron Orchid Designs tutorial video first. They go over the basics of applying a transfer. 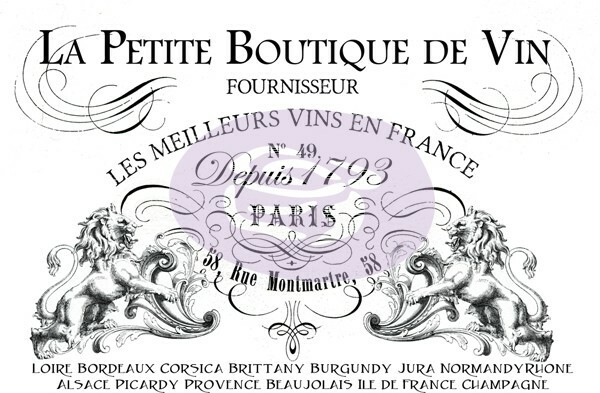 If you’ve never used a rub-on transfer of any kind, I’d also recommend ordering a set of the small french pot transfers (here) and trying them on something small first. I used these on this, this, and this. It’s a great way to get your feet wet and try the transfers on a smaller scale before moving to a large transfer on a piece of furniture. As always, you did an awesome job. I love what you did to this piece. Fabulous job!